Dr. Wardynski was busy this weekend dealing with a public relations issue that, as he put it, “will be replayed endlessly on TV in the local market here.” You see, Dr. Wardynski isn’t terribly concerned about student safety, or the fights that have been occurring and are even drawing the attention of the state’s auditors. He believes that he’s made things better in our schools. As he claimed on Saturday, “Over the last four or five years, we’ve done a lot to improve school discipline.” His primary reason for making the “SUPETalks” video on Saturday afternoon was not an attempt to address the fights that have been happening in our schools at an alarming rate. No, his primary concern is to address the issue of recording fights. If you prefer to read his comments, you may do so here. The superintendent may take reasonable measures to prevent violence at schools and to promote the safety of students, employees, and school visitors. Such reasonable measures may include in appropriate circumstances review of students public social media when such students have a history of violence, or where whose conduct in schools or in the community demonstrate a clear risk to students and employee safety. 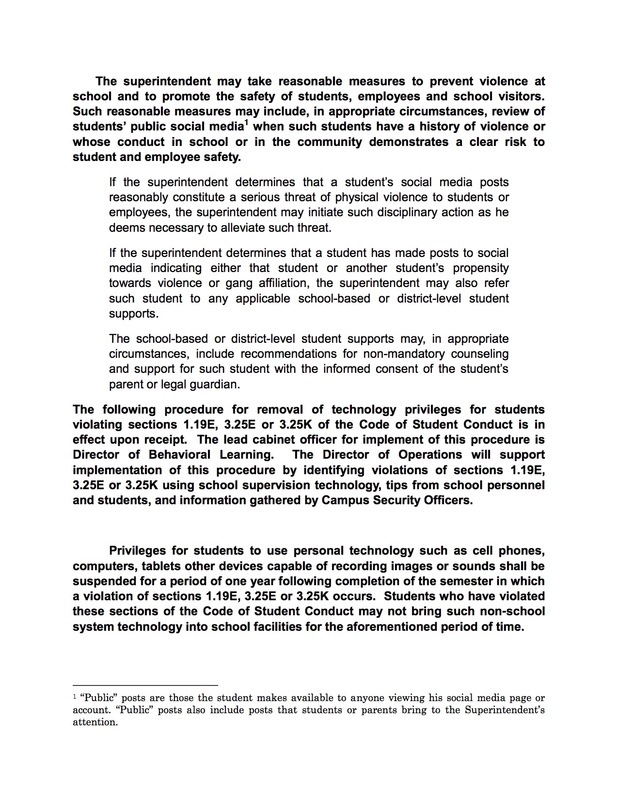 If the superintendent determines that a student’s social media post reasonable constitute a serious threat of physical violence to students or employees, the superintendent may initiate such disciplinary action as he deems necessary to alleviate such a threat. If the superintendent determines that a student has made posts to social media, indicating either that a student or another student, uh, propensity towards violence or gang affiliation, the student, uh excuse me, the superintendent may also refer such student to any applicable school-based, district-level student supports. The school-based, district-level student supports may in appropriate circumstances include recommendations for non-mandatory counseling, supports for such students within the informed consent of the student, uh, parent, or legal guardian. After watching this and reading what he said above, you’re probably thinking to yourself that I’m just looking for things to complain about. After all, he was clearly trying to “keep violence out of our schools.” He said so repeatedly. Much of the rest was at times unclear (“school-based, district-level student supports” just rolls off the tongue, doesn’t it? ), but the “keep violence out” was clear enough. Here’s why I didn’t write about this yesterday: I’ve learned from experience to wait until Dr. Wardynski puts things in writing. As the new Procedures for Safety Information that Dr. Wardynski detailed on Saturday wasn’t posted online until this morning. Here is a copy of the actual new procedure. As you may notice, the procedure that Wardynski put into effect “upon publication” on Saturday is significantly shorter than the procedure he printed this morning. It is absolutely clear that the primary purpose of this new “bog step forward” is to keep students from recording fights, rather than, you know, keeping students from fighting. The following procedure for removal of technology privileges for students violating sections 1.19E, 3.25E or 3.25K of the Code of Student Conduct is in effect upon receipt. The lead cabinet officer for implement [sic] of this procedure is Director of Behavior Learning. The Director of Operations will support implementation of this procedure by identifying violations of sections 1.19E, 3.25E or 3.25K using school supervision technology, tips from school personnel and students, and information gathered by Campus Security Officers. Privileges for students to use personal technology such as cell phones, computers, tablets other devices capable of recording images or sounds shall be suspended for a period of one year following completion of the semester in which a violation of sections 1.19E, 3.25E or 3.25K occurs. 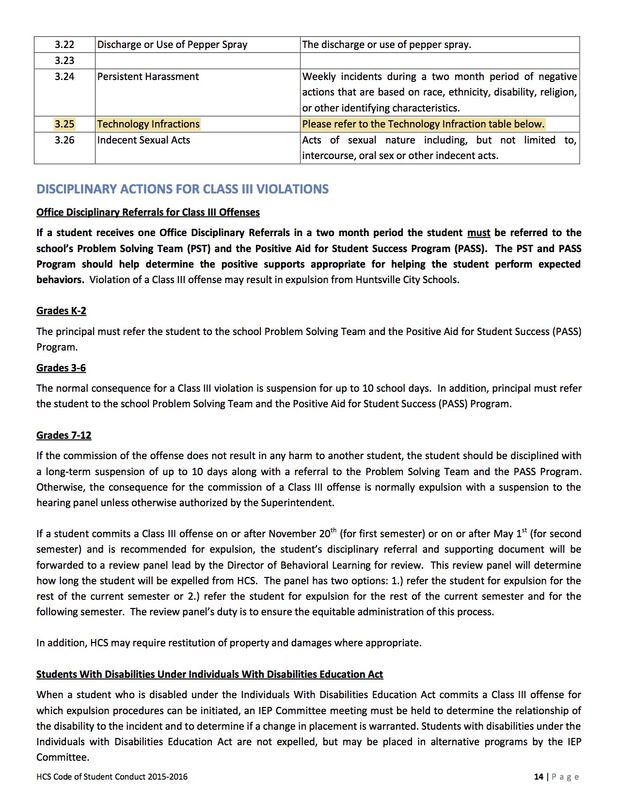 Students who have violated these sections of the Code of Student Conduct may not bring such non-school system technology into school facilities for the aforementioned period of time. “Public” posts are those the student makes available to anyone viewing his [sic] social media page or account. 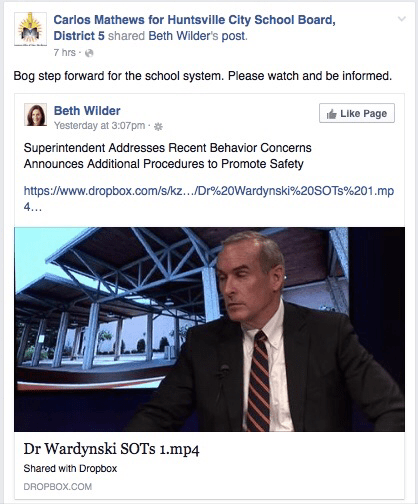 “Public” posts also include posts that students or parents bring to the Superintendent’s attention. I don’t think most people assumed that “public” posts meant any post that anyone has seen, but let’s focus on the two paragraphs above with the details about the Code of Conduct violations. I suspect that Wardynski will treat this as a Class III offense which would result in expulsion for up to ten days. Mr. Ward spent far more time in that interview talking about suspending and expelling students for recording a fight that for fighting in the fight. Does anyone else see a problem there? During the fight, a teacher rushed into the room not only to break up the fight, but also to insist that students keep their cell phones in their pockets. They were threatened with in-school suspension if they did not comply. Again, yes, the the authority figure rushing into a room during a fight was at least as concerned about the recording of the fight as the fight itself. Additionally, there are numerous reports online tonight of students being called into the office at Huntsville High to be told that they were going to be punished for recording fights that occurred during the week of the fifteenth, two weeks before the new procedure was implemented Saturday, February 27, 2016. Here’s the thing: if recording the fight is “transmitting obscene material,” isn’t the material being recorded also obscene? Evidently not to the superintendent. Fights behind closed doors aren’t a problem. It’s the reporting of the fight that’s the capital crime. So upon review of this information, it becomes clear that the superintendent’s Addressing of Behavior Concerns isn’t actually concerned about the behavior of fighting in schools at all. The behavioral concerns that the superintendent is attempt to address are the behaviors that embarrass him. And nothing else. Wardynski did not write this new procedure to address fighting or the ne’er do wells who plan violence online and then come into the school. He did not write this procedure to keep our children safe. He wrote this policy so that he would not be embarrassed by videos being “replayed endlessly on TV in our local market here” and for no other reason. This is a cheap, intimidation tactic of a bully wishing to control his own press. He omitted the primary reason for the new procedure on Saturday to convince people that he has the best interest of children at heart. The only reason to keep this information quiet during his ten minute video was to deceive people about the true purpose of this new procedure. If you didn’t believe that Wardynski needed to be fired before today, what more will it take? Well, a true educator would explain that if one wants to record a fight, please do so correctly. Make sure to hold the camera/phone still with a wide enough view to see all the bystanders, victims, and aggressors. The videos could be used for discipline, for training on the “fight or flight”, even for teaching such moral lessons as “why did you stand and film, when you could have used the energy to help break up the fight.” It’s crazy to tell kids to “keep your phones/cameras off, or you’ll get expelled”. How about, $50 reward for documenting fights with clear view of the faces, so the guilty can be punished and removed from the school. Seems like everything is upside down. Phones/cameras in the hands of everyone is how we view the world now. Why attempt to crush it? Why not make it into a mini-course in journalism, or at least use it as a last line of defense? Instead… we get no witnesses… so it never really happened. I recommend they keep filming… just get someone else that’s not a HCS student/employee to post it. They are looking at the schools video recordings to see who is hold up a phone to record. That’s the basis of the punishment. It doesn’t matter who posts it, only that a student recorded it. However, I do not believe that the district has a legal leg to stand on in punishing students for recording a fight. I will be working on that further. According to the policy, “The lead Cabinet officer for implement [sic] of this procedure is the Director of Behavior Learning.” Say what?!! Another director? They seem to be popping up all over the place. TO ALL PARENTS, have your children continue to record these fights. In order to prevent HCS bullies from taking any action on the student, present the recordings to reporters at news stations or present them to online media reporters rather than post to the individual’s social media. While I absolutely agree with the sentiment, the district is not punishing students for posting the videos; they are punishing students for recording them. They are using the security cameras in the building to identify the students who take out their cameras to record the fight. It does not matter to the district what the student does with the video after recording, it is the recording that they’re punishing. This is shaping up to be a great class action lawsuit by parents. I’m not sure I see how you’re interpreting this policy as you are. Where SPECIFICALLY within this policy is language that addresses recording of anything in school? I understand that what Ward said seems to hint at that action, but I don’t read it in the policy. Nonetheless, the problem with this is that the system is attempting to write education policy in legalistic terms, which practically BEGS that the rules be challenged on that basis. Notice, for example, the limiting language in this passage: “. . .in appropriate circumstances . . . when such students have a history of violence, or where whose conduct in schools or in the community demonstrate a clear risk to . . .safety.” There are many little buzzwords there that would require analysis to determine whether use of social media posts is appropriate/acceptable. Who determines what is an “appropriate” circumstance? And a history of violence WHERE? Within what period of time prior to the present? Does this mean any kind of violence of any level, or is there a TYPE of violence that is necessary to suggest a problem? What is a “clear” risk? Who determines that? In the real world, there is an independent arbiter who makes these sorts of determinations, and issues “permission,” if you will, for any sort of limitation of a person’s rights — whether that is a right of privacy or association or whatever. There doesn’t appear to be anyone within or without the school system who will serve that function. For that matter, to whom would a person even appeal that the rules had been applied inappropriately? What is the purpose of the limiting language if its practical effect is NOTHING? And why does this (once again) look like a collection of power and authority in the central office — or whichever offsite contractor they choose to do this work — rather than putting the power to exercise student discipline in the hands of the people who are ACTUALLY in contact with the students on a daily basis? If we continue to follow the law enforcement analogy, this is the equivalent of taking community policing function OUT of the hands of the beat cops and requiring that it all go through the police chief’s office. Where is the sense in that? But my favorite part is the discussion of punishment, where they school system (excuse me, student support activity) may also require students to attend non-mandatory counseling. What? I have kids in the school system, and I DO NOT WANT THEM HARMED while they’re at school. Period. But this is not the way to go about it. Thank you for your question. I’ll attempt to summarize why I believe the new procedure is directed towards the “recording” of the fights rather than the fighting of the fights. 1. All of the additional material that Wardynski did not read on Saturday deals with technology infractions. They do not address violence at all. 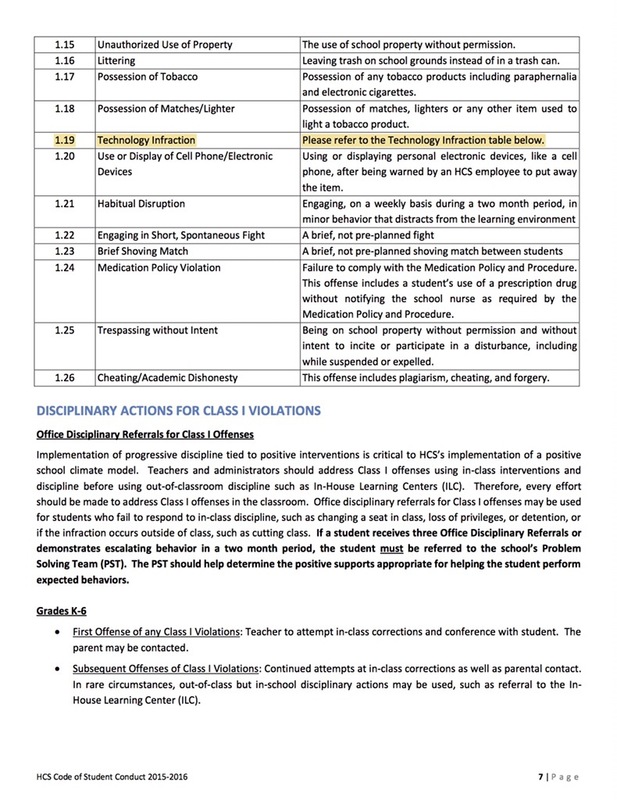 1.19E, 3.25E, and 3.25K are all references to the Technology Infraction section of the Student Code of Conduct. 2. The “Director of Operations” would be the primary person responsible for managing the Campus Security Officers and the in school security cameras. The additional text reads, “The Director of Operations will support the implementation of this procedure by identifying violations of sections 1.19E, 3.25E or 3.25K using school supervision technology . . . .” They are planning to use the schools’ cameras to see who is violating the technology sections of the code of conduct during an incident. 3. The final paragraph deals with the loss of technology privileges for using technology during a fight. 4. Keith Ward said that students who record a fight will be punished. 6. Yesterday students who had recorded the fight on February 16 were contacted and told that they would be receiving ISS for having recorded the fight. All of these reasons combined have convinced me that the primary purpose of the Superintendent’s speech was to make it a violation of the code of conduct to record a fight at a school. I hope this clears my reasoning up a bit; I’m sorry that my writing wasn’t clearer last night. Concerning your assessment of the rest of the policy, I completely agree. It’s worthless for addressing student safety. That was what I was planning to write about until I realized that the primary purpose was to quell the recording of the fights rather than the fights themselves. I am planning a follow up or two that addresses some of what you’ve pointed out. Suffice it to say that I do not believe that this will do a thing to address the issues of violence in our schools. I believe there many things that we could do, but spying on kid online and punishing kids for recording the fights are not going to help. You should do a bit of research before making assumptions. Dig into the current federal court order concerning discipline and how the Huntsville City Schools are forced to deal with fights in school. That might enlighten you. Also, take the time to research the impact social media has in actually encouraging fights at school. Videos posted on social media platforms are usually not in an effort to report violence at school. The primary impetus is notoriety. Anyone with the slightest idea of adolescent behavior can tell you the psychological impact these videos have on student behavior. Instant celebratory, albeit via abject behavior. I think in light of the federal mandate for school discipline, Dr. W. created the best solution possible. This is clearly not an issue of “hiding behavior,” as students can still report negative bahavior to their patents, etc. Thanks for taking the time to read what I have written and for sharing your thoughts about it here. I believe that I have done a significant amount of research. I have read the consent order both the proposed and the final versions, and the exhibits detail the zone lines. I am fully aware that the consent order requires the district to make changes in the application of discipline. I’m also aware that the order requires the district to be proactive in “creating positive school climates.” I don’t see anything in the new procedure that Wardynski revealed part of on Saturday that creates a “positive school climate,” but that’s certainly a point on which we can disagree. If you have some specific portion of the consent order that you believe I should study further, feel free to let me what you would like me to read, and I will be happy to do so. I am not arguing that any video should be posted online. When others have shared the videos with me, on Facebook, I have removed them. I have not shared the videos here, nor will I. However, if you truly belive that the recording of a fight by a student is a huge issue that must be addressed, perhaps you can explain why Dr. Wardynski did not address it when he shared the new procedure on Saturday. Why didn’t Dr. Wardynski make that his primary point on Saturday? Why bury it in legalese that required referencing multiple documents to interpret? If this is truly “the best solution possible,” why wasn’t he more forthright about what this solution entailed when he addressed it Saturday afternoon? Thanks again for sharing your opinions here. I appreciate it. I do, however, completely disagree that this is “the best solution possible” to address the fights that are occurring in our schools. A far better solution would be to support teachers in addressing discipline issues before they rise to this level. There is absolutely nothing in the consent order that requires teachers to be afraid to report discipline issues to their superiors in the school. There is nothing in the consent order that requires that teachers’ jobs be threatened for sending a child to the office. There is nothing in the consent order that suggests that teachers should be disrespected by the superintendent thus teaching their adolescent minds that disrespecting teachers is okay. If there are no fights to record… problem solved. Stop the fights and you stop the social media issues with posting the video of the fights. How is HCS going to stop the fights? My son reported a fight to me at Challenger Elementary today, it was an African-American 5th grader who had a white child in a head lock and was punching the other child repeatedly on the top of the head. My child stepped in to stop the abuse (though we have spoken about reporting to an adult instead.). His response was that he was too concerned for the other child’s well being and he would have been too hurt by the time an adult stepped in. While my child has been written up for much less (even class 2), how much do you want to bet the assaulting child WAS NOT WRITTEN UP and they will attempt to sweep the whole thing under the carpet. The point Russell makes is that Wardynski is more concerned with not recording and hiding the incidents rather than fix the problem. I assure you I will be requesting an end of month discipline report in order to prevent this from happening in the future. Reverse W’s and the board’s push to put angry violent kids into schools in which they don’t want to be, with people they hate. But that wouldn’t stimulate the white flight Casey and Jennie’s masters (Builders Association and Realtors with acres in the county) want so desperately. And if a teacher reports something like this occurring, they are putting their jobs at risk. Here’s a link to the 2015-2016 Code of Conduct. At a code of conduct faculty meeting at a high school early in the semester (of course not at the very beginning or before the school year started – ha! ), this class 2 offense was questioned by a teacher. She asked, “So we’re supposed to allow a child to cuss at us for two months before anything can be done with them?” Greg Hicks said yes, and it needed to be documented. Needless to say, the teachers were (and still are) in disbelief. This means that teachers now also need to be able to tell the future. How else will they know that a spontaneous fight will be short and not a brawl? Or a shoving match brief? Russ, were you aware that your link for “actual new procedure” is not at images.pcmac.org? Is this just a link typo or do you suppose we should read something else into this? I’m sorry. I must have pasted the link correctly. It has now been updated. Thanks for catching it. I think this new “procedure” makes Wardynski look weak. I stepped in a bog once, and I’ll tell you, I got stuck and never made such a mess. Is Carlos saying the system is getting into a bog, or quagmire? I think it’s a typo meaning “big.” But the irony is thick. The lower case letter “I” appears to be disabled. Looks to be an issue with the WordPress software Russ hosts the site with. I noticed everyone’s posts had the “i” removed…hmmmm. It was a bug in one of the extensions that I use that had been updated in the last 48 hours. 1. when it is appropriate for a teacher to break up a fight involving physical contact with the fighters? 2. If a teacher does not intervene does that count as child endangerment? 3. Have the teachers been taught safe takedown procedures? 4. If the teacher cannot break up a fight does confiscating phones trump seeking help? 5. And how is she to seek help without allowing a student to be in the hall, which is pretty much forbidden? 6. If there is a recording showing teacher attempted to intervene (or did not), how would that affect teacher dismissal if one parent said, teacher used excessive force on my child to break up a fight, or while the other parent said the teacher endangered my child by not breaking up the fight? 7. If there is no recording and no agreement among fighters or between fighters and teacher about what happened, will confidential witness statements be sought? 8. Or will students be expelled and teacher (in any of these scenarios) be fired or asked to resign since that would cause least problems? 9 . Is forbidding taping just in practice 1/3 of the strategy, the other two parts being getting rid of students and teacher? If I were crazy or desperate enough to teach in W World, is it always a lose/lose sotiation? The State guidelines are ambiguous. Teachers are held to a higher ethical standard when battery and assault are considered. Teachers are held to a higher ethical standard when child endangerment is considered. With such ambiguity and so little guidance from the State, you need all the evidence you can collect. Besides, unless something incredibly outrageous happens, just another school fight will get at most a few hundred hits and then be forgotten, and all who search for it will already know about it. When I questioned my son about the fight at Challenger Elementary I blogged about here last week, he told me all of the teachers (including his aid) just stood around and watched it. He stepped in to break it up as the other child was taking a repeated pounding on the head and crying. The coach had the audacity to verbally reprimand my child for stepping in to stop the assault. I told him I was proud of him and keep up the good work because the teacher’s were negligent. I DARE them to ever write up my child for breaking up a fight while the teachers just stood around to watch.